Getting previous MBA Studio resources up on the blog site, where they can be permalinked, so here is the transcript of a World MBA Tour online admissions essay advice service, where Avi appeared “live” as expert essay advisor. The text is “as was,” verbatim. Hi. I’d like to know what the adcomm focuses the most in the MBA essays- The good writing style, the touching stories, or the logical reasoning behind. Does it need to be concise or detailed with strong supporting? What does adcom focus on the most — good writing style, the touching stories, or the logical reasoning behind – actually none of these three specifically. Style is important, but just so you can be clear enough. Touching stories bring your argument to life. Logical reasoning helps to build your argument. The most important thing is the argument – why you are an excellent candidate, what you contribute, why you fit with the school and the program. Everything follows from that. Hi, I am now writing my essays for London Business School MBA. there are 2 questions I am not sure how to tackle . What well known historical event would you have liked to have been involved in and why? (500 words) First, I don’t know what the adcom tries to know from this essay and I am not sure what kind of events I can talk about. Also, I think that expressing some opinions may be risky. On the basis of your experience of working in and leading teams (either in your professional or personal life), please reflect on how you plan to contribute to your study group and the wider school community. (500 words) In this question, I want to be sure of the kind of contributions that can be made to the school community. I’ll take these one by one. First, “What well known historical event would you have liked to have been involved in and why?” This is one of the classic types of question (The question “archetypes” — as I’ve defined in my book) This question wants to get to know more about you as a person — what’s important to you, and why. The trick is to pick something that is in itself valid and significant, but also allows you to make one of your theme points. As to the second part of the question: they are asking you plain as daylight “plan to contribute to your study group and the wider school community” Tell them. Never mind what you think they want you to contribute. As long as it’s a valid contribution and you can credibly make it, they want it. What they want is diversity of contributions, not one thing. Wow, you’ll have to focus this a bit for me 🙂 I have written a whole book on this … which part of the essay process would you like me to address? HI Avi, nice to meet you! I´m new here! I found this TOP MBA Forum very helpful and would like to join Forum members. The problem is that I´m a Spanish native speaker interested in Chinese Culture.. to request the scholarship from Taiwan requires an appealing essay, writing an essay is a very hard-job!. what shall I probably write that possible works to get the Taiwan scholarship. Or what should never mention when writing an essay. Hi Alexander, again you’ll have to focus the question, or tell me more about yourself. Try to figure out what type of candidate gets the scholarship and emphasize your overlap with that kind of candidate. Dear Avi, As an international student and a person who is not good at writing, I want to know whether it is a big problem. Now facing the essay topics, I think I have some good ideas. But to convey them effectively and beautifully is not my strong point. Compared to some essays I have read, I feel very worried and ashamed with my writing. What should I do now? I want to give an example of what I mean here: When telling about getting out of shyness, someone who is good at writing may write “I no longer wanted to hide under the shell of a lethargic tortoise, or act as a pariah”, a sentence which seems impossible to come to my mind! Sorry Avi, let me ask one more question. Some colleges ask us to write extra essays. One of the most common topics is why we choose it (a college). We are international students, although we have try to find as much information about the college as possible, we don’t have any chance to visit the college or see things in real life. That is the reason this kind of essay is difficult. We can’t tell with all our heart! How could we make our essay effective? No problem Verma, ask away. In this question, are you asking me about the extra essay “If you want the committee to know anything and you have not had a chance to say it, say it here” … or by college do you mean the business school? They do want to know what you know what you know about their school because, for them, it’s about the FIT between you and them. If you don’t know what they are about, you can’t explain the fit. You don’t need to visit the school (it does help) but if you can’t do your best to speak to people who are there, or from there. One great way is to phone or email current students — expecially the heads of clubs and societies you are interesed in– and ask them any/all questions you like. Hello Avi! I have been asked to write an essay on post MBA career goals. I am not clear on how specific I should get. Also since I am interested in finance, should I talk only about finance about the MBA experience as well? Hi Nikolas, be as specific as possible. Details are the golden highway to admission. (Most people give generalities, and therefore they all sound like each other.) If you give details you will sound like a guy who knows what he is about, and where he’s going. That’s the kind of person who gets in. I’m not sure I understand the second part of you question — can you reframe it? One more point on goals: make them big and ambitious. If you have small life and career goals you don’t need an MBA. Hi! As a part of a business school essay I have been asked to evaluate a situation and communicate my decision. I wanted to know if business schools expect the case study format i.e analysis, alternatives and then recommendations or if there is some other way of structuring it. Secondly in my case the decision can be either yes or no. So the only way make my case stronger would be to give support to my decision? Have I understood it correctly? Can you tell me where I could find sample studies? I’m interested in knowing how better I could structure my essay. Thanks a lot! hi Avi, I have to write a cover letter for my application stating highlights of my objectives and qualifications for admission. Could you help with links or suggestions, Thanks in advance! Hi William, Is this MIT? A cover letter is a test to see if you can extract the salient points. (Senior managers need to be able to do this — executive summaries, etc.) It forces a clarity on you — you have to be able to reduce your argument for admission into a few paragraphs. That means you have to really understand what your argument is! Again clarity is the key. The scaffolding is “These are the three reasons I should be admitted to MIT … 1; 2; 3” Then take away the scaffolding. I have this question to fill out in an application for MBA at the university of Amsterdam? Now could you please provide a few hints on how I can assess self critically? Do I have to mention negative ideas in order to stress positive ones? or should I only list positive ideas? well I hope you can help me! Sana, what’s the question for Amsterdam? Generally, don’t put negative points unless they ask for them. If you mention negative things / characteristics, also say how you intend to fix them, or how B-school will help you fix them. Hi Avi! I was reading up articles on the web about writing a personal statement and some of the websites suggest writing the SOP in third person while others say that its better to write it in first person so that the SOP doesn’t look too wordy….What would you suggest????? As this is one thing which can sometimes make or break my application I just want it to be THE BEST!! Thanks in advance. Nazli, You are right that the essays make or break the application: Why is that? Because there are always too many people with great scores, great work exp., and great refs. Essays are the tie-breaker between top applicants. As to the Statement of Purpose: always always always in the 1st person. You must be personal. Try to come across as if this is a “fireside” chat with the head of the admissions committee. You get 15 minutes to tell her why you should be admitted rather than the other excellent candidates who are also wanting in. All right, I’ll take advantage of a break in the questions to try to summarize a few key points, valid for all competitive MBA applications. 1. You must have a clear “argument” as to why you are a worthy candidate and should be admitted. 3. Clarity is your friend. Don’t worry about being a literary buff. Just have an organized position and communicate it in an organized way. 4. Stories help you by bringing your theme points to life. Admissions readers are human — they read stories better than analysis. 5. Be personal. They want to get to know things about you that you can’t know from the Gmat, refs, transcripts etc. Essays must add value to what’s already in your file. Continuing the process of moving stuff off the static site to this new blog format, this in an interview I did with About.com . The questions allowed me to say some perhaps slightly less-than-usual things. The original is here. How soon should potential MBA students start preparing for the admissions process? the candidate needs to get immersed in the application process. Certainly s/he doesn’t want to dilute the process over years and years. That’s a recipe for a lukewarm application. Generally applicants should be wary of spending too much time on their application research and production – some do – at the risk of having their career stall and missing the key workplace award or promotion that would help them shine in front of Adcom. Should prospective MBA students submit applications to several schools or are they better of concentrating their efforts on one or two favorites? Both really. Favorites should be carefully targeted, no holds-barred. But the applicant should also be street-smart in recognizing that competition for top schools is intense, and any one favorite school acceptance may not emerge. In my experience the ideal number of applications is 4-5. Less means the randomness of random dings is not taken out the equation. More starts to dilute the energy of the applicant and recommender, and take too much time (ref answer above). In your book, MBA Admissions Strategy, you mention that nearly everyone under 35 with respectable undergraduate transcripts and a good professional record has a realistic chance of getting into the finest business schools. Some prospective students don’t share this optimistic view. I get a large number of emails from individuals who feel that poor GMAT scores or attendance at a less prestigious undergraduate school can hurt their chances during the admissions process. What advice can you offer these students? As to GMAT, yes, it is true a minimum threshold GMAT is necessary. If one is not in the high 600s, an application to a top-10 school will stall. But the GMAT works on a threshold principle – the applicant needs a high enough score to relax Adcom about his or her academic ability. After that they start asking other questions – about leadership, team skills, career arc, etc. Footnote to this is that, believe it or not, a GMAT score can be “too good” – anything above about 760 is problematic. This is because the applicant starts to look like a genius and questions will be asked about whether that person will make a good manager and leader. B-school is a professional place with the aim of turning out people who will survive and thrive in the cut & thrust of real world business. That’s what recruiters want. So Adcom looks carefully at apparent geniuses and dings them if it appears they may be better suited to PhD program and research career. What are four attributes every admissions committee wants to see in an MBA student? See my book, chapter 2 “Attributes that Count” for a list of 22 such attributes. It’s hard to say which 4 count the most. I think a clear success record is definitely up there; along with personal integrity; being a team player that mixes well; and leadership experience and potential. But there’s no privileged four. I strongly believe in all 22. How important is it for applicants to show that they possess these attributes? The key here is “show”. So many applicants claim they possess attributes. That’s worth nothing. The attributes have to be shown by telling proof stories – that is, anecdotes of the candidate in action, acquiring or living the attribute. What are the three most common mistakes that an MBA applicant can make, and how can these mistakes be avoided? 1. Trying to be a typical MBA applicant – leading to a generic and therefore low-value application. 2. Inability to see what is precious and valuable in their past activities, from Adcom’s point of view. 3. Wasting precious essay space with sentences and paragraphs that do not deliver or prove profile value. Is there any additional advice that you can offer students who are trying to develop an MBA admissions strategy? Candidates should balance their energy between the major blocks of an application, which are: (a)GMAT (b)File essay questions & long essays (c) Recommendations (d) Interview. (I assume their college record is set). In having helped hundreds of applicants get into top schools, the application strategy weakness I see most is candidates who are willing to spend an unbelievable amount of time and energy, not to mention money, trying to get their GMAT score up one notch, while neglecting the rest. As mentioned, the GMAT operates on a threshold principle – more is better up to a certain point – then more is irrelevant. And the balanced good application beats the unbalanced excellent/patchy application (and remember, they don’t want brainiacs). They are looking for people who appear good on all fronts. Someone who looks like they will continue to be good on all fronts. This is what I call the “CEO-in-Waiting” image. 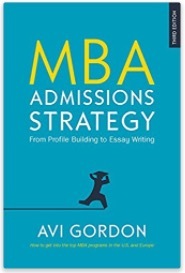 MBA Admissions Strategy: From Profile Building to Essay Writing, by Avi Gordon, is a McGraw-Hill bestseller, now updated again in its 3rd Edition . It is widely acclaimed as the best resource for MBA applicants. See reviews. 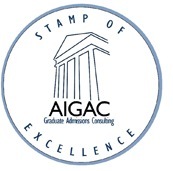 Avi Gordon, MBA Studio’s director, was an accredited member of the Association of International Graduate Admissions Consultants (the oversight and credentialing body in the graduate admissions field, see aigac.org) since its inception in 2007, and continues to practice by the standards and ethics of the association. Read MBA Studio + selected content via twitter and facebook as a daily newspaper. Applicant: [Oct 13] "Hi Avi, Just wanted to let you know that I have just got invited to interview with Columbia! This is really fast, my app has only been under review for a couple of days...I just wanted to thank you for your help! Will keep you posted. Thanks!" [Nov 10] "Just got a call from Columbia informing me that I got admitted! Again, thanks a lot for your help." — admitted to Columbia. Applicant: "I just wanted to thank you for your help. You might not remember me in your sea of clients, but I sure do remember and appreciate your help. I got admitted into Haas and class actually starts tomorrow. I couldn't have done it without you. After listening to the speeches during orientation, I'm almost positive that the profile you chose to emphasize was what got me in. You completely hit the jackpot. I can't thank you enough, especially considering I couldn't have gotten it all done in 8 days without your help. "— admitted to Haas Berkeley. Applicant: "Hi Avi, How are you doing? I received an email today from HKUST, they informed that I have been successful in my application and they will send out an offer letter in the next few weeks. I can not express my joy at the moment and I want to thank you so much for all your help and guidance throughout the selection process, especially since I was so last minute. I have already referred you to my brother-in-law who has expressed a desire to undertake an EMBA for the following year. I know he will learn a lot from you. Thanks again for everything. "— admitted to HKUST. Applicant: "I just wanted to drop you a note to let you know that I've been accepted at ESSEC's MBA in Luxury Brand Management! I got the call from Paris last week, after flying there for my interview last month. It was quite an experience, but I got through it and they have given me a place. Term starts in Sept, so I will be off to Paris end August. I'm ecstatic with the news and have lots of planning to do. But I just wanted to thank you for your help in my application. It was great working with you." — admitted to ESSEC. Applicant: "I just wanted to let you know that I was offered admission to Cornell and [my husband] to Columbia so we are both very happy that we got in and of course that we'll be starting school in the fall. Thanks again for helping us. "— admitted to Cornell and Columbia. Applicant: "Hello Avi, I just got admitted to the Kellogg MBA program. I just wanted to thank you for your time and effort in polishing my essays. I will be sure to leave a testimonial on your website. "— admitted to Kellogg. Applicant: "I have got some great news. I have been admitted at IESE! You were a great help on this. Really, you and and your book were of huge help! So, thanks again." — admitted to IESE. Applicant: "How's it going? I've been meaning to update you on my application. I was accepted without an interview for the January term at Columbia. I am now finishing most of my medical requirements and will begin the business school in January. Thanks for helping me with the essays. They must have been big b/c I was accepted about 3 weeks after submitting." — admitted to Columbia. Applicant: "Avi - I am very thankful to you for your help during the essay writing process. It was fun to work with you and even though I did not get into Wharton, I got into Berkeley which is awesome. Your straight forwardness and the interview prep were the two signature components of your services that I feel helped me shape my story and my interviews. Thanks again." — admitted to Haas Berkeley and Ross Michigan. Applicant: "Hi Avi, Just wanted to let you know, I have been admitted to the McCombs MBA at DFW. I wanted to write to you and thank you for all the advice and the adcom perspective I learned from you. Your help with the 3 essays and the recommendation letters were top notch and I believe they were the key differentiators, helping me to get into the program, especially the 3rd essay where I had to explain reasons around my past academic mistakes. Thank you again for all you did for me, I hope this MBA program will be a great step ahead for my career!" — admitted to McCombs. Applicant: "Hey Avi – I wanted to let you know that I was accepted into Columbia. Thanks for your feedback and comments throughout the process, they were very helpful." — admitted to Columbia. The MBA Admissions Studio has hundreds of satisfied clients. Below are some samples of applicant feedback. These are 100% genuine reports, exactly as written by clients. The MBA Admissions Studio stands ready to demonstrate the veracity of these comments, and the schools' acceptances, if required. Applicant: "Hey Avi, Just heard back from HBS. Fortunately it was positive ;). Will give it a week or two to sink in but everything points to Boston this fall. Anyways, super thanks for your help - both in coaching and on the essays. Was really helpful and I'm sure it strengthened my odds in the process. Will definitely recommend you to friends applying next year. Again, thanks!" — admitted to HBS. 'Avi Gordon has been instrumental when I applied to MIT Sloan School of Management. I got into MIT!! I also later got accepted into Wharton, Hopkins, and other top schools!n Avi helped develop my personal narrative and as I am already a physician and working professional, I can tell you his advice and approach was STILL invaluable. I bought the whole package and it was the best $$ I ever spent! I start at Sloan this Summer and I cannot wait.'" — admitted to MIT Sloan, Wharton, John Hopkins. Applicant: Avi, thought I would close the loop and let you know that I was admitted to the Yale SOM program and have decided to attend next fall. I wanted to let you know that I was very impressed with your services. You lived up to expectations with your concise, no holds-barred approach to feedback that was always returned in a timely manner. You drastically helped me increase the quality of my essays both in terms of content and prose, making my overall candidacy much stronger. — admitted to Yale S.O.M. Applicant: "You are splendid, magnificent, excellent! I cannot find the proper word to express how much I appreciate your valuable help to me. You are so good! I have updated based on ALL your suggestions... Hey, you can really make a difference. Very strong leadership ;) ...Your advice is my MBA bible! I think you really have the sharp eye for MBA applications. I really appreciate your valuable points. You are a really great mentor on my MBA applications.... Thank you once again for your great help! Thank you thank you thank you!." — (amalgam of emails from one client) admitted to Wharton. Applicant: "Avi, Good news: I am accepted at HBS!! Thanks a lot for your support. I did not make it to Stanford though (but does not really matter now!). Enjoy the holidays." — admitted to HBS. Applicant: "Avi, I wanted to let you know that I recieved an offer for LBS's EMBA. Thank you for all your help and advice on the Essay's as well as the Resume, it help me polish my application, focus my essays and taylor my resume towards business school and LBS. I also appreciated the flexibility in MBA Studio's services which allowed me to target specifically the areas where I needed advice." — admitted to LBS EMBA. Applicant: "I actually received my acceptance letter to the master’s program at the Cornell School last Wednesday! I am thrilled to have been accepted. I actually started my online pre-courses this afternoon. I have never been more excited to start school! I just wanted to thank you again for all of your help during this stressful experience. Your insight and guidance were invaluable and I attribute my acceptance to your help." — admitted to Cornell. Applicant: "I am glad that I chose the right service to guide me through the application process. With [your] help, I completed my applications with confidence and enthusiasm. It has been a challenging, yet rewarding experience!" — admitted to Kellogg. Applicant: "Hi Avi, Thanks a ton for all your guidance during this whole process! You're the best coach [I] could've hoped for." — admitted to Oxford Said. Applicant: "Hi, Sorry for the delay in the response, I took some time off my essays. Actually, I hired [competitor service - name withheld by MBA Studio] and I thought they were really bad. So I tried your free trial offer to help me benefit from a basis to establish my judgment towards them. Your feedback was so appreciated that I negotiated with them to get reimbursed, which I did in part. My Harvard and INSEAD packages are with them (could not be reimbursed) but let's get started with my other essays." — Montreal, Canada.